Facebook is hugely popular social networking website. Besides sending messages and updating status, users upload and share lot of photos among Facebook buddies. Do you want to quickly download specific Facebook photos or albums as easy to manage ZIP or PDF file? 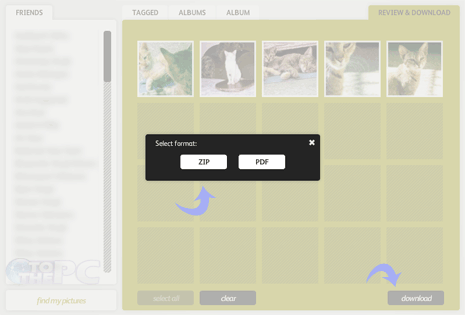 Online tool Pick n Zip allows you to download and save Facebook images without having to install any software or plugin. 1. Open Pick & Zip website on your computer. 2. Click Sign in button at bottom of webpage. 3. Login into Facebook account and grant access to this service to access public information (as set according to your Facebook privacy settings). 4. A new window load displaying Facebook friends and images. Click “Albums” tab and then click to open images in specific album. 5. Select individual or all photos and then click “Review & Download” button. 6. Then click “Download” button at bottom right and select format for downloading images among PDF or ZIP. Images are downloaded in best possible resolutiion in either PDF or ZIP format. For sure one quick and easy to grab Facebook photos without having to install any software. You can also explore other ways to download Facebook photos using Photo Grabber and Face Pad app.